SJKCH Pangkalan Baru Latest School To Join Trienekens-MPP Recycling Programme | Trienekens (Sarawak) Sdn. Bhd. 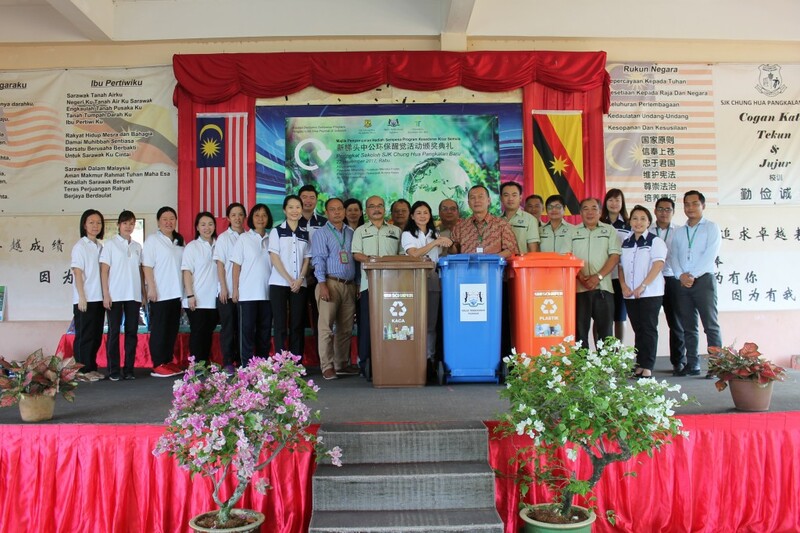 KUHCING – SJKCH Pangkalan Baru recently became the latest school to take part in the joint recycling programme introduced by Trienekens and Padawan Municipal Council (MPP). The project aimed to educate best practices in solid waste management and segregation as well as to boost recycling awareness among the school children. GREEN SCHOOL…Dato’ Ahmad (6th right) handing over the recycling bins to school’s headmistress Jong Siaw Hui (7th right), witnessed by Trienekens’ Group GM (Finance & HR) Tan (7th left) and MPP Councillors. In his officiating speech, MPP Deputy Chairman Cr. Dato Ahmad bin Dato’ Sri Ibrahim said that the Council’s focus was to raise public awareness about the importance of proper management of solid waste. Trienekens’ Group General Manager for Finance and HR, Tan Show Boon also spoke at the event and further explained that the programme is in line with the Company’s own effort to provide a platform where best practices in solid waste management and recycling can be introduced and incorporated into the school’s learning environment. Tan thanked MPP and the school for their great support and commitment in ensuring the success of the programme. She hoped that such an effective collaboration shall continue to progress in the coming years. At the ceremony, Dato’ Ahmad and Tan subsequently handed over a set of recycling bins and recycling posters to the school. Under the joint programme, several environment-related activities were carried out such as waste separation practices and scheduled collection of recyclables, awareness talk, Amazing Green Race game, inter-class most collected recyclables contest, colouring, poster design and eco-fashion competitions as well as other green initiatives for the school.